For the first time, the world’s most influential religious texts are brought together and presented on the same level, their coexistence acknowledged and celebrated.JUXTAPOSED: Religion is the first in the Juxtaposed series of curated bookshelves. At US $2500, this idea isn't cheap, but how can you put a pricetag on brotherly love. Just in case you were thinking that gnr8 will sell anything with LEDs in it, here's something we don't (unless you want to buy one of course). "tiretagz uses complex electronic circuitry and high frequency LEDs to creat patterns, image, words and even animations within the wheels of you car while you drive!" These would probably go great with that blue neon underbody light you just bought your car for Christmas. 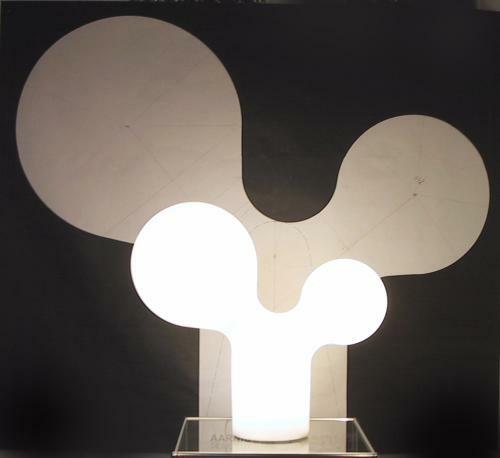 This unique design, basically consisting of 16 endlessly reconfigurable task lamps, isn't new. What's new is that it's just been "handpicked by Marcel Wanders to be part of the moooi collection." The chandelier is scheduled to have it's "moooi premiere" at Milan this month. 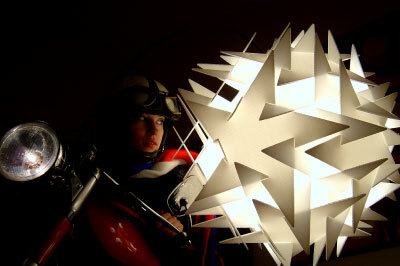 The Double Bubble series includes two table lamps and one sculptural standing lamp. 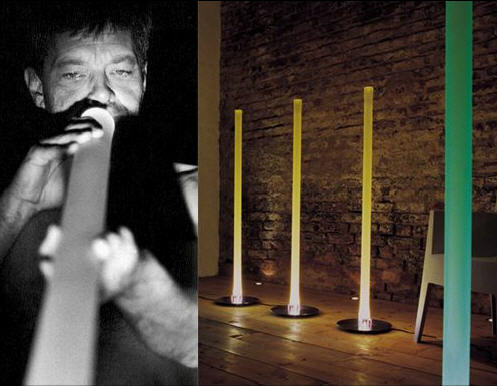 Initially created from blown glass, the lamps were ultimately cast in plastic to ensure durability and uniform light emission. The Europeans are definitely into organic plastic extruded shapes these days. Maybe they're on to something. Continuing last week's theme of "light cast", Beirut light design company CAI has come up with a light that takes it to the extreme. 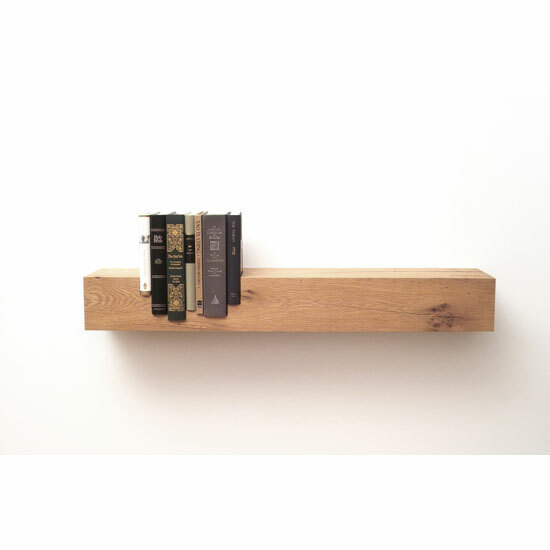 Splashing drop is a small wall light that creates a dramatic interplay of light and dark across the wall. Lately we've been starting to think about lighting more in terms of the light cast, rather than just how a particular piece looks when turned "on" (or off). British designer Anna Perring has designed a set of earthenware lights that are all about that. 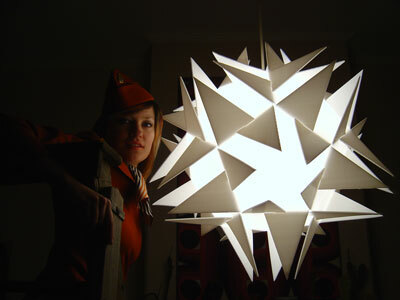 The aim was to create lights that would look right in a very modern space but that would be more organic and feminine. The patterns of light they scatter across a room have the quality of fairy lights and fireflies, which were a magical kick start to this project. Constructed from a series of angular interlocking pieces, automata lights have a strong dynamic presence when illuminated, creating an enchanting diffusion of light and shade. These pieces come flat packed, and seem to be pretty easy to assemble. A one-bedroom flat in London is believed to be the first in the world to be lit entirely by LEDs (light-emitting diodes). The Vos Pad is the brainchild of designer Marcel Jean Vos, whose design consultancy Vos Solutions has integrated the latest technologies to create ‘a blueprint for future living’. ACDC Lighting supplied over 120 colour-changing RGB LED fittings. A custom-built Lutron computerised system controls the level and colour of the lighting in different areas and can be used to create static or changing ‘moods’. The bathroom features an LED-illuminated spa bath and a colour-changing side-lit shower screen made from Litelogic panels. Similar panels provide colour-changing glass worktops in the kitchen. 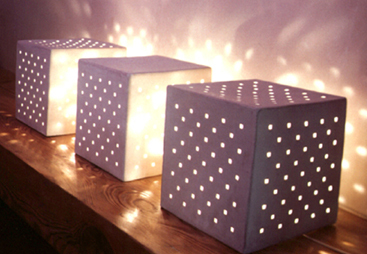 Simulated candles and specially commissioned LED sculptures add to the ambience. This state-of-the-art prototype apartment was designed by Marcel Jean Vos as a blueprint for future living. The lighting scheme sets a world precedent by being entirely based on fully dimmable, colour-changing light emitting diodes (LEDs) and demonstrates a comple tely new way of living with light. Decor and mood can be dramatically altered or gently mixed by microprocessor controlled lighting systems. 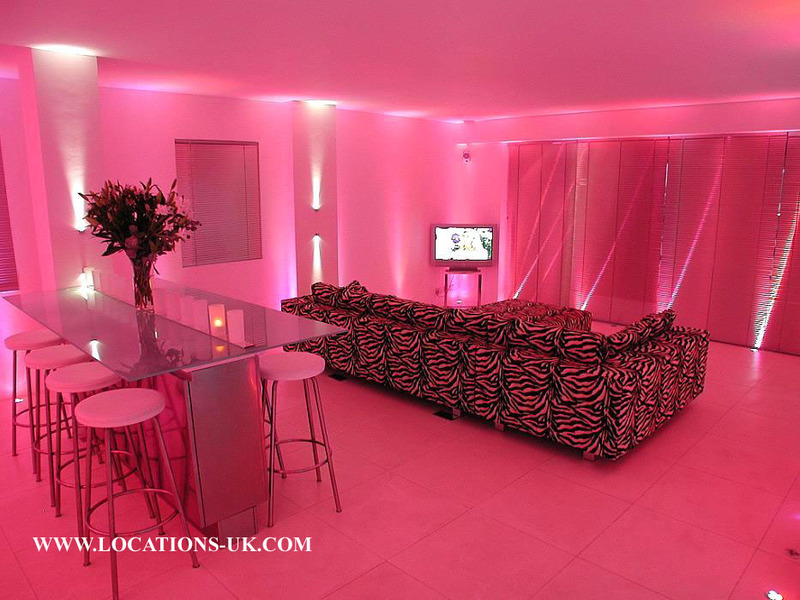 The Vos Pad is the world`s first apartment of its kind. 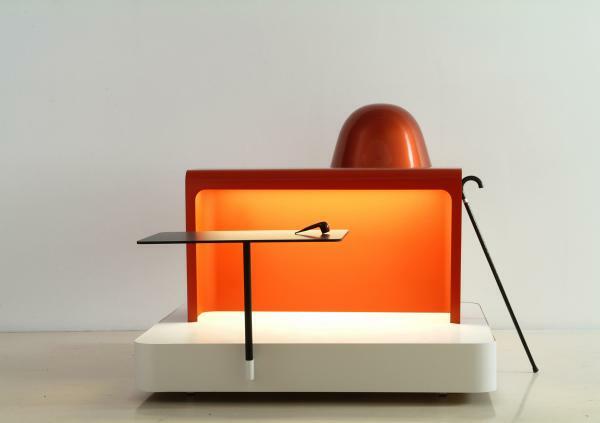 Continuing the Bouroullec theme, this is an installation of objects (including the orange lightbox) created for galerie kreo a bit more recently. I'll take one of these as well.